GROWBY Reading is a holistic, activity-based library program that has been developed by Hippocampus Reading Foundation for first-generation school-goers. 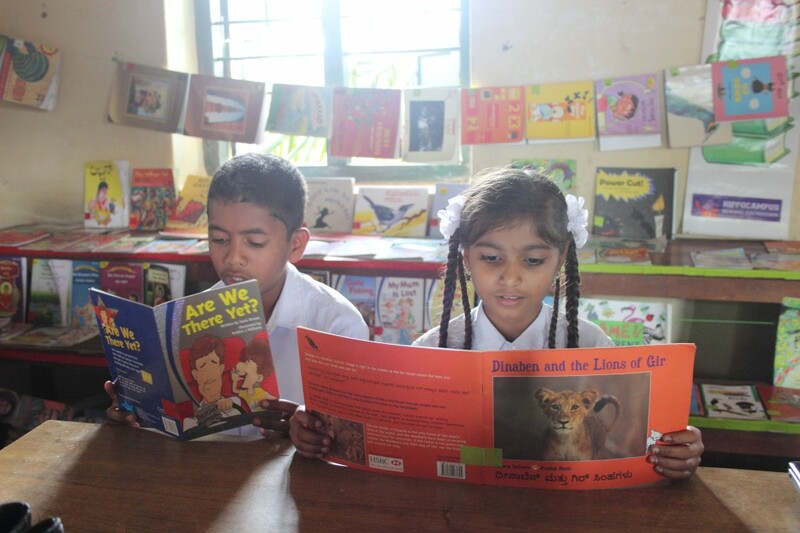 Through this program, Hippocampus aims to lead children to read books at their skill levels, assess their reading levels, and help improve their reading comprehension and fluency at a pace that they are comfortable with. Essentially, the program has been defined by six reading levels – Green, Red, Orange, White, Blue and Yellow – with Green being the beginner’s level and Yellow being ideal for the independent reader. Developed in 2004, the program is available in English, Hindi, Kannada, Tamil and Urdu. Today, GROWBY Reading is being used in 9 states by over 400 schools. Most importantly, the program has inspired thousands of children across the country to read for joy. 1) Starter Kit – A few basic tools (levelling guide, stickers for books, growth chart, catalogue & circulation registers, etc) that will help the librarian kickstart the library. 2) Booklist – A curated list of books (with details such as price, level, etc) from various publishers that are ideal for children from Grades 1 to 7. Hippocampus also offers guidance in procuring books. 3) Training – Training the librarian or a language teacher is crucial to the success of the program. Typically, it takes a day or two to train the librarian. Apart from the detailed training manual that supports the training, Hippocampus also offers support via phone and email throughout the course of the academic year. 4) Vibrancy Activities –A set of x fun activities with detailed session plans that can be conducted by the librarian for Grades 1 to 7 with an aim to increase vibrancy in the library. 5) Data Analysis – A simple analysis is done to assess the impact of GROWBY Reading on your school. Tried-and-tested with an incredible amount of success by leading organizations like Room to Read, Azim Premji Foundation, Makkala Jagriti, Hope Foundation, Akshara Foundation, Andhra Pradesh Social Welfare Residential Educational Institutions Society (APSWREIS), etc.